In french,"Bébête" has a double signification, meaning "animal" but also "silly". And such is the case here with these strangely human animals (or is it strangely animal humans?) The cuckoo goes into another bird's apartement, throws the bird's kids by the window and replaces them with his own. Like a cuckoo does! Just one of the stories offered here in a hard and beautifuly drawned vision of the world of animals. Simon Bossé was born 1966 in Montréal. A central part of the new wave of Canadian underground comix of the 90's, he has worked as a publisher, curator, retailer, silkscreener and cartoonist. He also curated numerous exhibitions, edited the international anthologies Kekrapules and Ferraille’s Montreal issue. 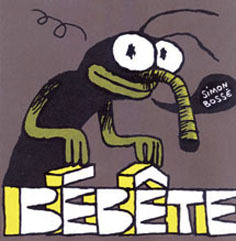 Bébête, the second Simon Bossé album for L'Oie de Cravan, was shortlisted for the 2010 Dough Wright Award. 48p. 20.5 x 20.5 cm, fall 2009.Limited edition of 700 copies under a cover silkscreened by the author. Wordless.